$60.00 Out of stock. Email me when new stock arrives. Up, up, up it rises -- out of a box of magic wands, a single wand stands above the rest. When your audience of youngsters see it rise (and you don't! ), the laughter is inevitable. But it gets better when the wand surprises everyone by leaping 3 feet into the air! Finally, when your audience least expects it, the remaining six wands propel upwards every which way! It's a Wand Explosion! This is a gem of a kids trick – a prop that’s guaranteed to drive children wild! Kids love magic where the magician’s props are animated, taking on a life of their own -- and this prop delivers. Watch the video and you’ll see the potential for building comedy, anticipation and surprise into your show. a wand rise or fall at your command, repeating it indefinitely to the delight of your young audience. a wand leap 2 – 3 feet into the air, catching it with your free hand. 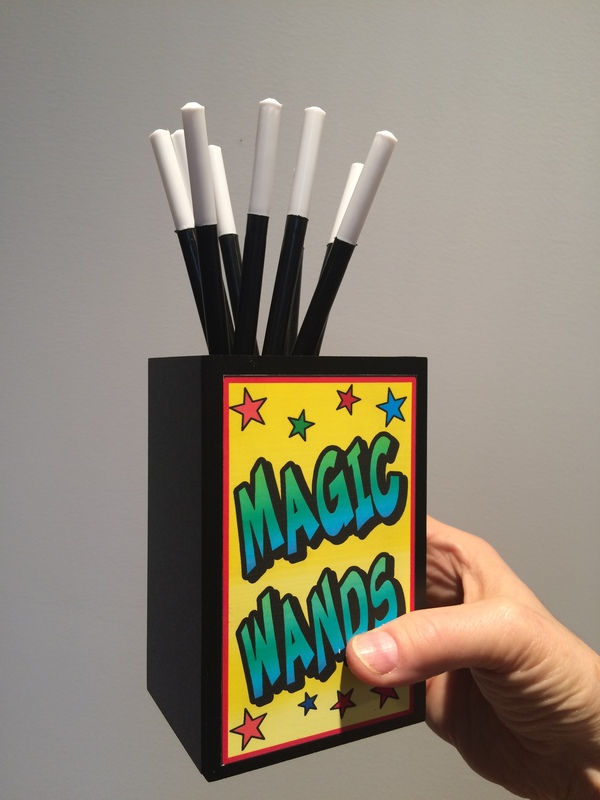 a bunch of wands jump 2 – 3 feet out of the box at the same time. Danny Orleans, of AmazeKids, demonstrates three ideas with Wand Explosion in the video. You’ll see a stage routine as well as one for a birthday party setting designed to make sure kids don’t rush your performing space in a “Wand Grab” moment. Another routine makes a vanished silk appear on a wand as it leaps from the box. There are no electronics to worry about and it’s oh-so-easy to work. It comes with written instructions, twelve 7” wands and the secret gimmickry to catapult the wands, and your show, to new heights. Whether you do a full-blown routine, perform it as a running gag, or use it for a one-time LOL moment, you can be sure your audience will explode with laughter when you perform Wand Explosion.